Aspen Santa Fe Ballet dancer Jenelle Figgins' dance bag reflects her proactive approach to well- being. Rather than carrying a one-shouldered bag, which aggravates her back problems, she switched to a backpack. The rest of her essentials are neatly packed into their own small containers. "You know how you have a junk drawer? This is my junk bag, my safety net," she says. Inside, there's everything from face wash to homeopathic products like lavender essential oil and Bach Rescue Remedy, a flower essence. "They help calm me down when I'm dealing with stress throughout the day," she says. "I didn't know about Rescue Remedy until I came to Colorado, but all the dancers use it." When she's seeking focus or motivation, Figgins turns to her favorite Philips headphones. "I carry these around all the time and I always have music on," she says. Currently, she's listening to albums like Kendrick Lamar's DAMN. and Solange's A Seat at the Table. Figgins is also a huge reader: "I bring books on tour and then I buy more." In addition to novels, she likes to read books with positive affirmations, like Deepak Chopra's The Seven Spiritual Laws of Success. Daniil Simkin. Courtesy Works & Process at the Guggenheim. On the heels of his successful 2015 project INTENSIO , American Ballet Theatre principal Daniil Simkin is presenting a new multi-media work at the Guggenheim Museum's Works & Process series set in the museum's multistoried rotunda. "The rotunda is iconic, white and symmetrical," he says. "Having dance and projection in there is an amazing sight." The new work, created by Hubbard Street Dance Chicago resident choreographer Alejandro Cerrudo, is titled Falls the Shadow and will premiere September 4. Spanish ballerina Lucia Lacarra left Bavarian State Ballet, her company of 14 years, in 2016 for life as an international guest artist, accompanied by her husband and fellow dancer, Marlon Dino. As an artist on the move, she packs her roomy dance bag with only the bare necessities. When she's home in Germany, however, the rest of the space is reserved for supplies for her 2-year-old daughter, Laia. Along with snacks, a changing bag, water, a pacifier and baby wipes, Laia requires her favorite toy lamb named Baa Baa. In New York City for the Youth America Grand Prix gala, Lacarra pared her dance bag back down to the essentials. "As you mature as an artist you learn what you need to carry and how to limit yourself," she says. When she was younger, Lacarra would tote multiple brands of the same product, but now she knows exactly what she likes. Some items even pull double duty: Tan tape protects blisters and secures her wedding ring, which Lacarra wears when she performs. Damian Woetzel releases Lovette at Vail. Photo by Erin Baiano. New York City Ballet principal Lauren Lovette is no stranger to Colorado's Vail Dance Festival—she's performed there each summer since 2011. This year, she returns not only as a dancer but as a choreographer. Lovette gained recognition for her September 2016 choreographic debut at NYCB, For Clara. On August 7, Vail audiences will see her latest major commission. Being in the corps can be pretty unforgiving. You dance in nearly every performance, it sometimes feels like you're only onstage to add to the scenery, and you're expected to fit in—while still vying for soloist roles. It's enough to make even the most determined dancer lose steam. 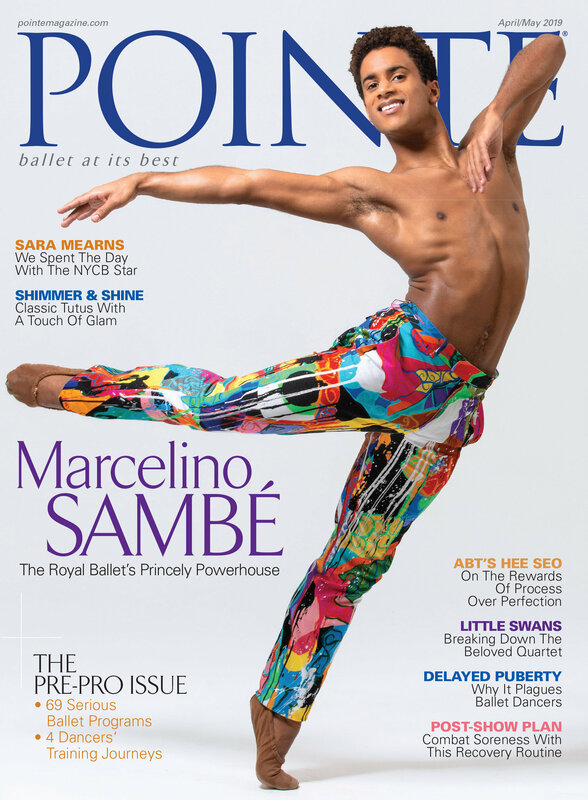 Pointe spoke with three corps de ballet dancers about how they use a combination of self-discipline and creativity to keep themselves motivated. After a few years, morning class can feel like a chore—especially during heavy rehearsal periods when your body just wants to rest. But rather than viewing it as a drag, try reframing class as a chance to show your best, hardest-working self. For San Francisco Ballet corps member Rebecca Rhodes, class is a time to push harder, not slack off. "It's a great time to be noticed," she says, especially for dancers hoping to be cast in featured roles. "I make sure to do every combination two or three times, and I try not to pick and choose what's comfortable," she says. This week Ballet West inaugurates its National Choreographic Festival: Two weekends of triple bills, featuring Ballet West in world premieres by Val Caniparoli and Nicolo Fonte, along with four guest companies performing recent creations. Visiting companies include Sarasota Ballet, Pennsylvania Ballet, Oregon Ballet Theatre, and Pacific Northwest Ballet.